Jenny resides in Arkansas, where, as a teacher, she hangs out with teens on a regular basis. Sometimes there’s a fine line between comedy and tragedy—and Katie Parker is walking it. School is winding down for the summer but Katie Parker is having a bad day. After leaving the drive-in, where her imploding love life was the main attraction, Katie arrives home to a big surprise on the Scott's front porch. Her mother, Bobbie Ann Parker, a former convict and recovering addict, wants to take Katie away from her family, friends, and church. Now Katie's life will be changed by a series of dramatic choices as she struggles to understand what family and home really means. Katie is forced to walk away from In Between, leaving behind a family who loves her, a town drive-in to save, and a boyfriend who suddenly can’t take his eyes off his ex. 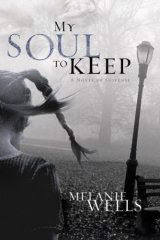 When the life her mother promised begins to sink faster than one of Maxine’s stuffed bras, Katie knows she needs to rely on God to keep it together. But where is he in all this? Can Katie survive a chaotic life with her mother—and one without the Scotts? And if God is there, will he come through before it’s too late? 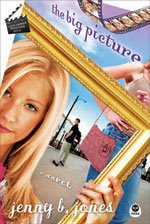 A Katie Parker Production series offers teen girls real-world fiction balanced by hope and humor. The The Big Picture helps us realize that the difficult chapters in our journey are only part of God's big story for our lives. Want to know one of the secrets to becoming successful as an author? In this business, one HAS to possess people skills. The anguished, introverted, lonely writer might be a great image, but it's a faulty image. Dealing with people becomes impossible to avoid when one becomes an author, as there are fans, the media, bookstore employees, book clubs, etc. with which to deal. People skills are required to connect with your fans and give a good, personable interview. Invest in YOU before that book comes out and brush up on your people skills. Or at book signings, you WILL be that lonely writer! If you're looking for a printer, look no further than Got Print. They have some of the best prices on business cards, bookmarks, postcards and brochures out there. And their quality is top notch! I use them for all my printing needs. "Remember that self-trust is the first secret of success. So trust yourself." "Be sure to image right, for we tend to become as we see ourselves. So see yourself confidently." "Remember Thomas Edison's dynamic statement: 'If we did all the things we are capable of, we would literally astound ourselves'." "Drop the word 'impossible' from your mental proccess." "You can be greater than anything that can happen to you." 6. Simon & Schuster, Inc.
For more facinating statistics, visit Dan Poynter's site!!! While teaching my promoting class the other night, someone posed a question regarding book tours. They asked how is it feasible to do a physical tour when the average author only sells 20 books per signing? There are many answers. Some author don't do book signings for this very reason. If you're doing a tour or a signing, you need to get the most bang for your buck. Set multiple signings in one day or weekend. Stop at other stores along your route to sign copies on hand and leave promotional materials such as bookmarks. Be sure to do as much promotion as possible by contacting the newspaper and radio for articles & interviews. Physical book tours can be quite expensive, especially for the publisher who sends their author on a month long tour with a chauffer, hotels and plane tickets. However, authors can tour for just the price of gas if they are smart, with an occasional hotel thrown in now & then. And remember - sometimes success is measured in terms of exposure, not just sales! Looking for a book festival? Athol Dickson's university-level training in painting, sculpture, and architecture was followed by a long career as an architect then his decision several years ago to devote full time to writing.Athol Dickson’s writing has been favorably compared to the work of Octavia Butler(Publisher’s Weekly), Daphne du Maurier (Cindy Crosby, FaithfulReader.com) and FlanneryO’Connor (The New York Times).His They Shall See God was a Christy Award finalist and his River Rising was a Christy Award winner, selected as one of the Booklist Top Ten Christian Novels of 2006 and a finalist for Christianity Today's Best Novel of 2006.He and his wife, Sue, live in Southern California. Visit AtholDickson.com for more information. Eleven years ago, Vera Gamble's brother left their house never to be seen again. 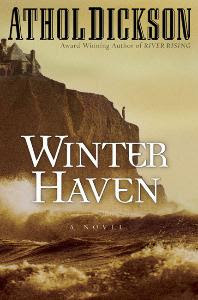 Until the day Vera gets a phone call that his body has been found...washed ashore in the tiny island town of Winter Haven, Maine. His only surviving kin, Vera travels north to claim the body...and finds herself tumbling into a tangled mystery. Her brother hasn't aged a day since last she saw him. Determined to uncover what happened in those lost years, Vera soon discovers there are other secrets lurking in this isolated town. But Winter Haven's murky past now seems bound to come to light as one woman seeks the undeniable and flooding light of truth. Provide waiting room copies to doctors - be sure to have an order form in the book! T-shirts and other apparel, like baseball caps & sun visors. Before you can formulate a riveting story, an interesting character must be devised. Many writers envision the setting first and the people inhabiting that world second. This often results in shallow characters. Developing a character in depth, complete with flaws, will give you a basis for your narrative. It is easier to build a plot around an individual than force that character into unrealistic situations. Two factors will determine your character – their background and their personality type. Both are equally important and require some thought. Humans all share similar feelings and needs, but how they respond to those depends on their upbringing and their basic, fundamental personality. You need to be aware of these factors when writing your story. Backgrounds are as varied as humans themselves. Race, culture, religion, and economic status all contribute to one’s development as a person. A person’s moral compass is easily affected by their upbringing, and you need to keep this in mind when creating your characters. A person raised by a loving family on a farm and someone raised on the streets of New York will not react the same! Flesh out your character with a family history, interests, and experiences. Become familiar with the four basic personality types – choleric, sanguine, melancholy and phlegmatic. They will also determine how your character reacts in any given situation. (“Personality Plus” by Florence Littauer is an excellent book for researching these personality traits.) A bold, first-born choleric would likely take charge in a situation, while an introverted phlegmatic would step aside. You need to be aware of these personality traits in your character or you will find them responding in a dubious fashion. Avoid the temptation to create a perfect character! People are flawed creatures and the more imperfections and internal conflicts your character possesses, the more intriguing your story. Give them weaknesses, impulses and unresolved issues. Negative aspects of your character might improve and eventually vanish, but this needs to be developed slowly during the course of your narrative. Life altering moments happen for us all, but a sudden change for no apparent reason will be looked upon as a mere plot contrivance. Characters will always be the drive and focal point of any story. By putting a great deal of thought into your main characters, you will form interesting, relatable people. Once you have established this foundation, you can begin creating an intriguing tale! If you have self-published a book, you want to be sure it is listed with as many online directories as possible. One such place is Self Publisher's Place. They require the cover art, short description, full synopsis, and a link to your website. There's many great books out there on how to market and promote a book. But in branching out beyond book promotion, I stumbled upon another great book - "Success Secrets of the Online Marketing Superstars" by Mitch Meyerson. It's designed to fit any product or service, but there's a lot of information that ties in well with a book, physical or E-book. It covers a wide range of ideas, from blogs to affiliates to email list building. At times it appears almost overwhelming, as no one could do every single thing in this book to the extent the various authors have suggested. But like John Kremer's "1001 Ways to Market Your Book", you'll come away with some great ideas! A native of the Texas panhandle and the child of musicians, Melanie Wells attended Southern Methodist University on a music scholarship (she's a fiddle player), and later completed graduate degrees in counseling psychology and Biblical studies at Our Lady of the Lake University and Dallas Theological Seminary.She has taught at the graduate level at both OLLU and DTS, and has been in private practice as a counselor since 1992. She is the founder and director of LifeWorks counseling associates in Dallas, Texas, a collaborative community of creative therapists.When the Day of Evil Comes is her first published work of fiction, and the first of a three-book series. The second work, The Soul Hunter was released in May, 2006. Melanie lives and writes in Dallas. It’s psychology professor Dylan Foster’s favorite day of the academic year…graduation day. And her little friend Christine Zocci’s sixth birthday. But the joyful summer afternoon goes south when a little boy is snatched from a neighborhood park, setting off a chain of events that seen to lead nowhere. The police are baffled, but Christine’s eerie connection with the kidnapped child sends Dylan on a chilling investigation of her own. Is the pasty, elusive stranger Peter Terry to blame? 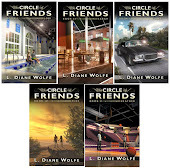 Exploding light bulbs, the deadly buzz of a Texas rattlesnake, and the vivid, disturbing dreams of a little girl are just pieces of a long trail of tantalizing clues leading Dylan in her dogged search for the truth. "Happiness Information, Coaching, Books, Courses, Inspirational Quotes, Training, Personal Development, Articles"
Have you selected the right keywords for your website? Did you put what you thought would attract traffic? Or did you place yourself in the shoes of your prospect/reader? Did you test your keywords? Did you check with Google Keywords to see how high they ranked? Are you constantly updating your keywords? And if not ... why not??? *Oh the wonderful things I learn doing research for my seminars - of which I booked SIX today!!! I occasionally recommend other websites and services here and today I'd like to recommend my own editor, Bob Spear! the writing and publishing communities. And he's already helped me tremendously with the design layout of my books just from editing! So give Bob a ring and tell him Spunky Diane sent you! 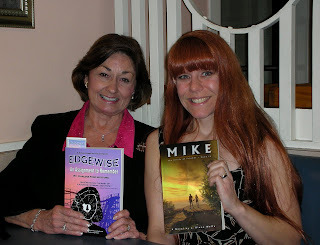 One of the best things about my tour to Atlanta was meeting up with friend and fellow author, Darlene Ford Wofford! Darlene is a living testimony to the power of the human spirit! An award-winning author, speaker and former radio host, she is an inspiration to all who meet her. Nicole Seitz is a South Carolina Lowcountry native and the author of The Spirit of Sweetgrass as well as a freelance writer/illustrator who has published in numerous low country magazines. A graduate of the University of North Carolina at Chapel Hill's School of Journalism, she also has a bachelor's degree in illustration from Savannah College of Art & Design. Nicole shows her paintings in the Charleston, South Carolina area, where she owns a web design firm and lives with her husband and two small children. 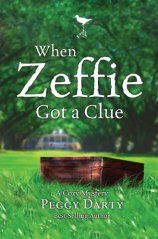 Nicole is also an avid blogger, you can leave her a comment on her blog.Seitz's writing style recalls that of Southern authors like Kaye Gibbons, Anne Rivers Siddons, and Sue Monk Kidd, and this new novel, which the publisher compares to Kidd's The Secret Life of Bees, surely joins the ranks of strong fiction that highlights the complicated relationships between women. Highly recommended, especially for Southern libraries. In the South Carolina Sea Islands lush setting, Nicole Seitz's second novel Trouble the Water is a poignant novel about two middle-aged sisters' journey to self-discovery.One is seeking to recreate her life yet again and learns to truly live from a group of Gullah nannies she meets on the island. The other thinks she's got it all together until her sister's imminent death from cancer causes her to re-examine her own life and seek the healing and rebirth her troubled sister managed to find on St. Anne's Island.Strong female protagonists are forced to deal with suicide, wife abuse, cancer, and grief in a realistic way that will ring true for anyone who has ever suffered great loss. "This is another thing I know for a fact: a woman can't be an island, not really. No, it's the touching we do in other people's lives that matters when all is said and done. The silly things we do for ourselves--shiny new cars and jobs and money--they don't mean a hill of beans. Honor taught me that. My soul sisters on this island taught me that. And this is the story of true sisterhood. It's the story of Honor, come and gone, and how one flawed woman worked miracles in this mixed-up world." There are many words in the English language that are commonly misused. Always check the exact definition and spelling to be sure you are using it properly in a sentence. Like to share with you the best aspect of my tour - all the special people I met along the way! From the enthusiastic redhead at the hotel (thanks, Ellyn!) to the awesome book store crews, everyone made me feel welcome. Rolena, Joan, David, Terri, Allison - big hugs! And the special people who believed in the message of my books enough to purchase a copy - Jo (believe in that youth group!!! ), Janet (a special spirit! ), Darien, Jennifer, and all the others - thanks so much for your support. Never forget - when the dream's big enough, the facts don't count! As I prepare to head to Atlanta and a whirldwind of book signings (and will not be blogging for a few days), I wanted to leave some suggestions here for others embarking on a book tour. Always try to book several stores when traveling a distance greater than three hours. (Especially with today's gas prices!) Also try to stop at stores along the way to leave book marks and sign any copies they have on hand. Peggy Darty is the award-winning author of twenty-seven books, including two other cozy mysteries set in Summer Breeze, Florida: When the Sandpiper Calls and When Bobbie Sang the Blues. She has worked in film, researched for CBS, and led writing workshops around the country. Darty and her husband call Alabama home but spend a great deal of time in Colorado, Montana, and on Florida’s Emerald Coast. It’s an ordinary afternoon in Summer Breeze, Florida, when a young, wide-eyed girl steps into I Saw It First, the trash-to-treasure shop Christy Castleman and her Aunt Bobbie have opened. Clutching a jewelry box, Zeffie Adams tells Christy she needs money to pay her grandmother’s medical bills, prompting Christy to offer this curious visitor more than the jewelry box is worth–or so she thinks. But complicated questions form when Christy rips out the box’s lining and uncovers a clue to a cold case murder mystery from eight years ago. Despite warnings from her family and handsome boyfriend Dan Brockman, Christy decides to do a little detective work of her own. After all, the infamous murder happened close to her grandmother’s farm. How risky could it be to take the jewelry box back to the Strickland plantation and ask around about it? Soon Christy finds there is more to the small box than someone wants her to know. A jewelry theft. A mansion murder. Dangerous family secrets buried in history. Can Christy convince others to let go of the past before it’s too late? Most people write because they enjoy it, but never stop to think if their work is marketable. Whether publishing yourself or seeking a publisher through submissions, your book must be in a genre or on a topic that will sell! In his book "Publishing For Profit", Thomas Woll recommends defining your editorial niche. 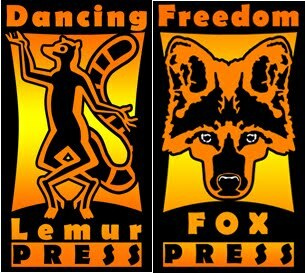 What makes your book unique within the market? Do you have particular expertise within this market? Where in the store is this category placed? What are the attributes of competitive books? What is the average number of copies sold within this category? Are sales in the category expanding or contracting?" So do your research before you pour your heart & soul into a book!